Here is the NorthEscambia.com guide will all you need to know to watch the Flomaton Hurricanes in their state championship game Thursday in Auburn in person or on television. Google map – Click here. Stay on College St. for approximately three miles and turn left on Donahue Drive. Parking (see below) will be on the right on Donahue Drive. Auburn University will still be completing its Fall 2018 academic term, so event parking will be working around normal campus activities and Super 7 parking on the Auburn University campus will be limited. All parking for the Flomaton game will be directed to the Hay Field Lot at Donahue Drive and Len Morrison and the Seed Processing Plant Lot located at Donahue Drive and College Street. Complimentary shuttle service on Tiger Transit beginning at 8 a.m.
NorthEscambia.com has issued a “Hurricane Warning” for 11 a.m. Thursday in Auburn. Otherwise it will be sunny. Expect a kickoff temperature of about 48 degrees warming into the low 50’s after the half. Winds will be light from the north or northeast. The Flomaton Hurricanes will take the Tiger Walk from from the Auburn Athletics Complex down Donahue Drive to Jordan-Hare Stadium at about 9:15 a.m. Smoking is prohibited inside the stadium. This policy also includes the use of electronic cigarettes. Advance one-day tickets are available for $12 plus a convenience fee at GoFan. Seating is general admission, and you can present a printed paper or your mobile ticket at the gate. Click here to order. If you wish, you can stay for the 1A final a (Linden vs. Mars Hill) at 3 p.m. and the 5A final (Vigor vs. Clay Central) at 7 p.m. at no additional charge with your ticket. Tickets at the gate are $15. Children age 5 and older much have a ticket. A paid game subscription is required to watch on a computer, phone, tablet or other device. Pat Dye Field at Jordan-Hare Stadium, the nation’s 10th-largest on-campus stadium, with a capacity of 87,451, has served as home of the Auburn Tigers since 1939. 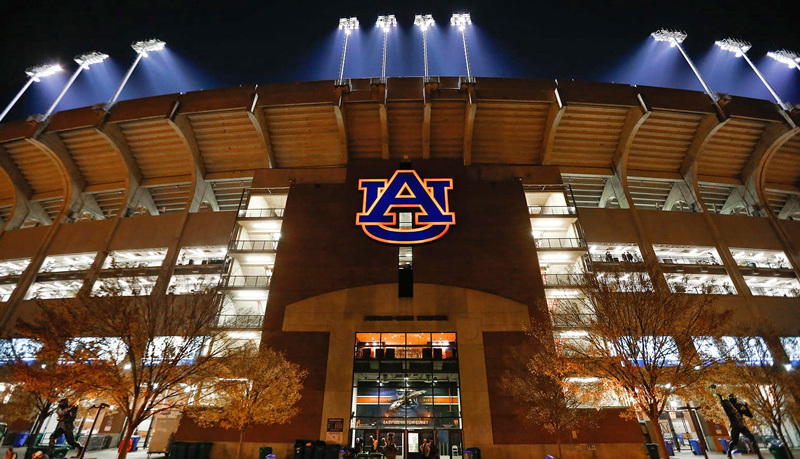 On football Saturdays in Auburn, Jordan-Hare Stadium becomes Alabama’s fifth-largest city. More than 75,000 season tickets have been sold to Auburn home games in each of the last 18 years. The stadium is named for Ralph “Shug” Jordan, Auburn’s all-time winningest football coach, and Clifford Leroy Hare, a member of Auburn’s first football team, president of the old Southern Conference and longtime chairman of Auburn’s Faculty Athletic Committee. Legendary coach Pat Dye has also had his name forever attached to Jordan-Hare Stadium, as the turf officially became known as Pat Dye Field at Jordan-Hare Stadium prior to the 2005 Iron Bowl. Dye, who served as head coach and athletics director at Auburn from 1981-92 and was inducted into the College Football Hall of Fame in December 2005, led Auburn to a 99-39-4 record and four SEC Championships in his 12 seasons on the Plains. Thanks North Escambia! Great information, very detailed. and extremely helpful. I hope a category 5 hurricane hits Jordan Hare tomorrow and blows the competition away. Go CANES!! !